Due out this year (2015) is a new edition of Dorling Kindersley's Merriam-Webster Children's Dictionary. I reviewed a copy, available via Edelweiss, focusing on its Native content. Here's some of my notes/thoughts. It includes (if I counted right) 27 specific "group[s] of American Indian people" --- but nowhere did the editors use the word 'nation' or 'sovereign' or 'government' to describe these "group[s} of American Indian people." The editors are focusing on individuals and languages, both of which are important, but, our status as self-governing sovereign nations is the single most important fact about who we are. Like some of you, I'm wondering how, out of the hundreds of options, they chose those particular nations. 1 special or fancy dress (as for wear on the stage or at a masquerade) 2 a style of clothing, ornaments, and hair used during a certain period, in a certain region, or by a certain class or group <ancient Roman costume> <peasant costume>. Many countries and regions have one or more traditional national costumes. These often reflect the lifestyles that people led in the past, both in terms of climate and in the type of work undertaken by many inhabitants of the country. "the sari is worn in India" - lines point to "short top" and "sari"
"a costume worn in Finland" - line point to "boots made from reindeer fur"
"a costume worn in Vietnam" - lines point to "scarf" and "piece of cloth wound around the legs"
"a costume worn in Korea" - lines point to "silk jacket" and "sports shoes are not traditional"
"a costume worn in Tanzania" - lines point to "bead necklace" and "bead belt" and "colorful cloth tied around the body"
"Eskimo costume worn in Canada" - lines point to "modern parka" and "insulated boots"
I don't think someone in India would call a sari a costume. Do you? Same with the boots worn in Finland, the items worn in Vietnam, etc. If, however, a kid who isn't of those places or people wears one of those items, then I think it would be accurate to say it is a costume. 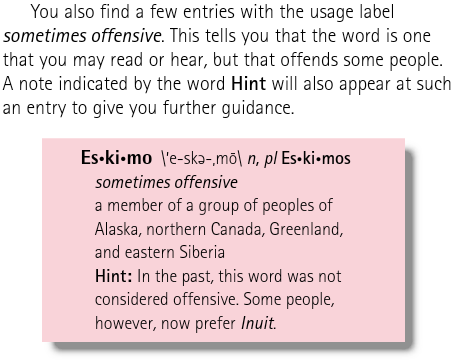 Thinking about that usage label, I wondered if the word "squaw" is included. It isn't (it isn't in the 2000 version either; see update at end of review). I looked at other words commonly used for Native people. Of course, each nation has its own language and its own word for man, woman, child, baby, etc. The third entry for brave is "an American Indian warrior" (p. 121). Though I've seen "brave" used as a standard word for man (or braves for men), I think they're trying to say that it is a person who fights. Like a soldier. I wonder who first used brave to describe Native fighters? Cooper?! The entry for medicine man is "a person especially among American Indian groups believed to have magic powers to cure illnesses and keep away evil spirits." Contrast that to the definition of priest and you see some bias: "a person who has the authority to perform religious ceremonies." Sachem is "a North American chief" (p. 700) but it is like the word papoose--it has become the default word for chief. In fact, the word is Narragansett and the Narragansett's use it today. I don't know anyone from another tribe who calls their leader a sachem. Interestingly, the entries for chief don't include reference to Native leaders. Entries for hogan, tepee (better spelling is tipi), powwow, and totem pole, are ok. The entry for tom-tom is "a drum (as a traditional Asian, African, or American Indian drum) that is beaten with the hands" (p. 834). It should not include American Indian because we use drumsticks, not hands, to beat our drums, and we do not call them tom-toms. The entry for reservation could be better. It is not wrong to say it is "land set aside for American Indians to live" but it raises questions like, who set it aside, why, and when. Wampum is created from the shell of a clam. The bead is cut from the white and purple parts of the shell. The shell is thought of as a living record. The speaker puts the words of the agreement into the wampum. Each speaker thereafter uses the wampum to remember the initial agreement and the history that has happened to date. Go read the rest of the page and you'll understand why the definition is wrong. The definition for wigwam suggests that they are no longer in use, which is inaccurate and it doesn't specify what nations use them. In conclusion, this was an interesting exercise (and tiring), going through this dictionary. I hope the editors make changes next time around to make it more accurate and less biased. 2 any of the languages of the Inuit people. Update (first update above was within minutes of the review being uploaded. Here's another update, within an hour of the review being uploaded): Thank you, Michelle, for looking at the 2000 edition of this dictionary. It does not have the word squaw in it. Does someone have an older version?